Created by skittoli on Nov 11, 2008 11:34 PM. Last modified by skittoli on Jan 20, 2011 4:34 AM. Now that you’ve downloaded JBoss and have run the server for the first time, the next thing you will want to know is how the installation is laid out and what goes where. At first glance there seems to be a lot of stuff in there, and it’s not obvious what you need to look at and what you can safely ignore for the time being. To remedy that, we’ll explore the server directory structure, locations of the key configuration files, log files, deployment and so on. It’s worth familiarizing yourself with the layout at this stage as it will help you understand the JBoss service architecture so that you’ll be able to find your way around when it comes to deploying your own applications. Fundamentally, the JBoss architecture consists of the JMX MBean server, the microkernel, and a set of pluggable component services - the MBeans. This makes it easy to assemble different configurations and gives you the flexibility to tailor them to meet your requirements. You don’t have to run a large, monolithic server all the time; you can remove the components you don’t need (which can also reduce the server startup time considerably) and you can also integrate additional services into JBoss by writing your own MBeans. You certainly do not need to do this to be able to run standard Java EE 5 applications though. You don’t need a detailed understanding of JMX to use JBoss, but it’s worth keeping a picture of this basic architecture in mind as it is central to the way JBoss works. The JBoss Application Server ships with three different server configurations. Within the <JBoss_Home>/server directory, you will find four subdirectories: minimal, default and all - one for each server configuration. Each of these configurations provide a different set of services. The default configuration is the one used if you don’t specify another one when starting up the server. has a minimal configuration—the bare minimum services required to start JBoss. It starts the logging service, a JNDI server and a URL deployment scanner to find new deployments. This is what you would use if you want to use JMX/JBoss to start your own services without any other Java EE 5 technologies. This is just the bare server. There is no web container, no EJB or JMS support. is a base Java EE 5 server profile containing a default set of services. It has the most frequently used services required to deploy a Java EE application. It does not include the JAXR service, the IIOP service, or any of the clustering services. The all configuration starts all the available services. This includes the RMI/IIOP and clustering services, which are not loaded in the default configuration. If you want to know which services are configured in each of these instances, look at the jboss-service.xml file in the <JBoss_Home>/server/<instance-name>/conf/ directory and also the configuration files in the <JBoss_Home>/server/<instance-name>/deploy directory. The default configuration is the one used if you don’t specify another one when starting up the server. To start the server using an alternate configuration refer to “Start the Server With Alternate Configuration”. The directory server configuration you’re using, is effectively the server root while JBoss is running. It contains all the code and configuration information for the services provided by the particular server configuration. It’s where the log output goes, and it’s where you deploy your applications. ”Server Configuration Directory Structure Table” shows the directories inside the server configuration directory (<JBoss_Home>/server/<instance-name>) and their functions. The conf directory contains the jboss-service.xml bootstrap descriptor file for a given server configuration. This defines the core services that are fixed for the lifetime of the server. The data directory is available for use by services that want to store content in the file system. It holds persistent data for services intended to survive a server restart. Serveral JBoss services, such as the embedded Hypersonic database instance, store data here. The deploy directory contains the hot-deployable services (those which can be added to or removed from the running server). It also contains applications for the current server configuration. You deploy your application code by placing application packages (JAR, WAR and EAR files) in the deploy directory. The directory is constantly scanned for updates, and any modified components will be re-deployed automatically. This directory contains JAR files (Java libraries that should not be hot deployed) needed by this server configuration. You can add required library files here for JDBC drivers etc. All JARs in this directory are loaded into the shared classpath at startup. This is where the log files are written. JBoss uses the Jakarta log4j package for logging and you can also use it directly in your own applications from within the server. This may be overridden through the conf/ jboss-log4j.xml configuration file. tmp The tmp directory is used for temporary storage by JBoss services. The deployer, for example, expands application archives in this directory. work This directory is used by Tomcat for compilation of JSPs. The files in the conf directory are explained in the following table. jboss-service.xml defines the core services and their configurations. The jndi.properties file specifies the JNDI InitialContext properties that are used within the JBoss server when an InitialContext is created using the no-arg constructor. This file configures the Apache log4j framework category priorities and appenders used by the JBoss server code. This file contains sample server side authentication configurations that are applicable when using JAAS based security. The props directory contains the users and roles property files for the jmx-console. This file provides the default configuration for the legacy EJB 1.1 CMP engine. standardjboss.xml This file provides the default container configurations. standardjbosscmp-jdbc.xml This file provides a default configuration file for the JBoss CMP engine. xmdesc/*-mbean.xml The xmdesc directory contains XMBean descriptors for several services configured in the jboss-service.xml file. The files in the deploy directory are explained in the following table. bsh-deployer.xml This file configures the bean shell deployer, which deploys bean shell scripts as JBoss services. cache-invalidation-service.xml This is a service that allows for custom invalidation of the EJB caches via JMS notifications. It is disabled by default. client-deployer-service.xml This is a service that provides support for Java EE application clients. It manages the java:comp/env enterprise naming context for client applications based on the application-client.xml descriptor. ear-deployer.xml The EAR deployer is the service responsible for deploying Java EE EAR files. ejb-deployer.xml The EJB deployer is the service responsible for deploying JEE EJB JAR files. hsqldb-ds.xml hsqldb-ds.xml configures the Hypersonic embedded database service configuration file. It sets up the embedded database and related connection factories. http-invoker.sar http-invoker.sar contains the detached invoker that supports RMI over HTTP. It also contains the proxy bindings for accessing JNDI over HTTP. jboss-aop-jdk50.deployer This service configures the AspectManagerService and deploys JBoss AOP applications. jboss-bean.deployer jboss-bean.deployer provides the JBoss microcontainer, which deploys POJO services wrapped in .beans files. jboss-ha-local-jdbc.rar jboss-ha-local-jdbc.rar is an experimental version of jboss-local-jdbc.rar that supports datasource failover. jboss-ha-xa-jdbc.rar jboss-ha-xa-jdbc.rar is an experimental version of jboss-xa-jdbc.rar that supports datasource failover. jboss-local-jdbc.rar jboss-local-jdbc.rar is a JCA resource adaptor that implements the JCA ManagedConnectionFactory interface for JDBC drivers that support the DataSource interface but not JCA. jboss-xa-jdbc.rar jboss-xa-jdbc.rar is a JCA resource adaptor that implements the JCA ManagedConnectionFactory interface for JDBC drivers that support the XADataSource interface. jbossjca-service.xml jbossjca-service.xml is the application server implementation of the JCA specification. It provides the connection management facilities for integrating resource adaptors into the JBoss server. jboss-web.deployer The jboss-web.deployer directory provides the Tomcat servlet engine. jbossws.sar jbossws.sar provides JEE web services support. messaging/destinations-service.xml destinations-service.xml configures a number of Messaging queues and topics used by the Messaging unit tests. messaging/messaging-service.xml The messaging-service.xml file configures the core JBoss Messaging service. jmx-console.war The jmx-console.war directory provides the JMX Console. The JMX Console provides a simple web interface for managing the MBean server. jmx-invoker-service.sar jmx-invoker-service.sar is an unpacked MBean service archive that exposes a subset of the JMX MBeanServer interface methods as an RMI interface to enable remote access to the JMX core functionality. This is similar to the legacy jmx-rmi-adaptor.sar, with the difference that the transport is handled by the detached invoker architecture. jsr-88-service.xml jsr-88-service.xml provides the JSR 88 remote deployment service. mail-ra.rar mail-ra.rar is a resource adaptor that provides a JavaMail connector. mail-service.xml The mail-service.xml file is an MBean service descriptor that provides JavaMail sessions for use inside the JBoss server. management/console-mgr.sar console-mgr.sar provides the Web Console. It is a web application/applet that provides a richer view of the JMX server management data than the JMX console. You may view the console using the URL http://localhost:8080/web-console/. monitoring-service.xml The monitoring-service.xml file configures alert monitors like the console listener and email listener used by JMX notifications. properties-service.xml The properties-service.xml file is an MBean service descriptor that allows for customization of the JavaBeans PropertyEditors as well as the definition of system properties. scheduler-service.xml The scheduler-service.xml and schedule-manager-service.xml files are MBean service descriptors that provide a scheduling type of service. sqlexception-service.xml The sqlexception-service.xml file is an MBean service descriptor for the handling of vendor specific SQLExceptions. uuid-key-generator.sar The uuid-key-generator.sar service provides a UUID-based key generation facility. The "all" server configuration file set is located in the <JBoss_Home>/server/all directory. In addition to the services in the "default" set, the all configuration contains several other services in the conf/ directory as shown below. cluster-service.xml This service configures clustering communication for most clustered services in JBoss. deploy-hasingleton-service.xml This provides the HA singleton service, allowing JBoss to manage services that must be active on only one node of a cluster. httpha-invoker.sar This service provides HTTP tunneling support for clustered environments. iiop-service.xml This provides IIOP invocation support. juddi-service.sar This service provides UDDI lookup services. snmp-adaptor.sar This is a JMX to SNMP adaptor. It allows for the mapping of JMX notifications onto SNMP traps. The following table explains the files providing ejb3 services. ejb3-interceptors-aop.xml This service provides the AOP interceptor stack configurations for EJB3 bean types. ejb3.deployer This service deploys EJB3 applications into JBoss. jboss-aop-jdk50.deployer This is a Java 5 version of the AOP deployer. The AOP deployer configures the AspectManagerService and deploys JBoss AOP applications. jbossws.sar This provides Java EE 5 web services support. Finally, in the EJB3 "all" configuration there are two additional services. ejb3-clustered-sfsbcache-service.xml This provides replication and failover for EJB3 stateful session beans. ejb3-entity-cache-service.xml This provides a clustered cache for EJB3 entity beans. You can add your own configurations too. The best way to do this is to copy an existing one that is closest to your needs and modify the contents. For example, if you weren’t interested in using messaging, you could copy the production directory, renaming it as myconfig, remove the jms subdirectory and then start JBoss with the new configuration. Move to JBOSS_DIST/jboss-as/bin directory and execute the run.bat (for Windows) or run.sh (for Linux) script, as appropriate for your operating system. JBoss AS now binds its services to localhost (127.0.0.1) by default, instead of binding to all available interfaces (0.0.0.0). This was primarily done for security reasons because of concerns of users going to production without having secured their servers properly. To enable remote access by binding JBoss services to a particular interface, simply run jboss with the -b option. To bind to all available interfaces and re-enable the legacy behaviour use -b 0.0.0.0. In any case, be aware you still need to secure your server properly. For more information including setting up multiple JBoss server instances on one machine and hosting multiple domains with JBoss, please refer to the Administration and Configuration Guide. Some examples on binding are shipped in <JBOSS_HOME>/docs/examples/binding-manager/sample-bindings.xml. JAVA_OPTS: -Dprogram.name=run.sh -server -Xms1503m -Xmx1503m -Dsun.rmi.dgc.client. More options for the JBoss AS run script are discussed in The Section “Start the Server With Alternate Configuration” below. Note that there is no "Server Started" message shown at the console when the server is started using the production profile, which is the default profile used when no other is specified. This message may be observed in the server.log file located in the server/production/log subdirectory. -b, --host=<host or ip>       Bind address for all JBoss services. To shutdown the server, you simply issue a Ctrl-C sequence in the console in which JBoss was started. Alternatively, you can use the shutdown.sh command. A JMX client to shutdown (exit or halt) a remote JBoss server. Using the shutdown command requires a server configuration that contains the jmx-invoker-service.xml service. Hence you cannot use the shutdown command with the minimal configuration. You can configure the server to run as a service under Microsoft Windows, and configure it to start automatically if desired. Download the JavaService package from http://forge.objectweb.org/projects/javaservice/. Where <depends> is the name of any service that the JBoss AS server depends on, such as the mysql database service. Once the service is installed the server can be started by using the command net start JBoss, and stopped with the command net stop JBoss. Please refer to the documentation included in the JavaService package for further information. When the JBoss Server is running, you can get a live view of the server by going to the JMX console application at http://localhost:8080/jmx-console. You should see something similar to Figure “View of the JMX Management Console Web Application”. 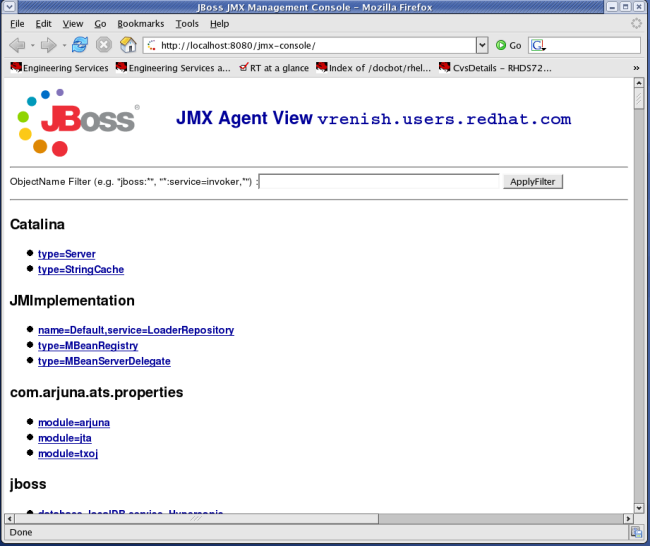 The JMX Console is the JBoss Management Console which provides a raw view of the JMX MBeans which make up the server. They can provide a lot of information about the running server and allow you to modify its configuration, start and stop components and so on. For example, find the service=JNDIView link and click on it. This particular MBean provides a service to allow you to view the structure of the JNDI namespaces within the server. Now find the operation called list near the bottom of the MBean view page and click the invoke button. The operation returns a view of the current names bound into the JNDI tree, which is very useful when you start deploying your own applications and want to know why you can’t resolve a particular EJB name. Look at some of the other MBeans and their listed operations; try changing some of the configuration attributes and see what happens. With a very few exceptions, none of the changes made through the console are persistent. The original configuration will be reloaded when you restart JBoss, so you can experiment freely without doing any permanent damage. If you installed JBoss using the graphical installer, the JMX Console will prompt you for a username and password before you can access it. If you installed using other modes, you can still configure JMX Security manually. We will show you how to secure your console in “Security Service”. Hot-deployable services are those which can be added to or removed from the running server. These are placed in the JBOSS_DIST/jboss-as/server/<instance-name>/deploy directory. Let’s have a look at a practical example of hot-deployment of services in JBoss before we go on to look at server configuration issues in more detail. This is hot-deployment in action. Now that we have examined the JBoss server, we will take a look at some of the main configuration files and what they are used for. All paths are relative to the server configuration directory (server/production, for example). The core services specified in the conf/jboss-service.xml file are started first when the server starts up. If you have a look at this file in an editor you will see MBeans for various services including logging, security, JNDI, JNDIView etc. Try commenting out the entry for the JNDIView service. Note that because the mbeans definition had nested comments, we had to comment out the mbean in two sections, leaving the original comment as it was. If you then restart JBoss, you will see that the JNDIView service no longer appears in the JMX Management Console (JMX Console) listing. In practice, you should rarely, if ever, need to modify this file, though there is nothing to stop you adding extra MBean entries in here if you want to. The alternative is to use a separate file in the deploy directory, which allows your service to be hot deployable. In JBoss log4j is used for logging. If you are not familiar with the log4j package and would like to use it in your applications, you can read more about it at the Jakarta web site (http://jakarta.apache.org/log4j/). Logging is controlled from a central conf/jboss-log4j.xml file. This file defines a set of appenders specifying the log files, what categories of messages should go there, the message format and the level of filtering. By default, JBoss produces output to both the console and a log file (log/server.log). There are 5 basic log levels used: DEBUG, INFO, WARN, ERROR and FATAL. The logging threshold on the console is INFO, which means that you will see informational messages, warning messages and error messages on the console but not general debug messages. In contrast, there is no threshold set for the server.log file, so all generated logging messages will be logged there. If things are going wrong and there doesn’t seem to be any useful information in the console, always check the server.log file to see if there are any debug messages which might help you to track down the problem. However, be aware that just because the logging threshold allows debug messages to be displayed, that doesn't mean that all of JBoss will produce detailed debug information for the log file. You will also have to boost the logging limits set for individual categories. Take the following category for example. This limits the level of logging to INFO for all JBoss classes, apart from those which have more specific overrides provided. If you were to change this to DEBUG, it would produce much more detailed logging output. This creates a new file appender and specifies that it should be used by the logger (or category) for the package org.jboss.ejb.plugins.cmp. The file appender is set up to produce a new log file every day rather than producing a new one every time you restart the server or writing to a single file indefinitely. The current log file is cmp.log. Older files have the date they were written added to their filenames. Please note that the log directory also contains HTTP request logs which are produced by the web container. The security domain information is stored in the file conf/login-config.xml as a list of named security domains, each of which specifies a number of JAAS  login modules which are used for authentication purposes in that domain. When you want to use security in an application, you specify the name of the domain you want to use in the application’s JBoss-specific deployment descriptors, jboss.xml (used in defining jboss specific configurations for an application) and/or jboss-web.xml (used in defining jboss for a Web application. We'll quickly look at how to do this to secure the JMX Console application which ships with JBoss. Almost every aspect of the JBoss server can be controlled through the JMX Console, so it is important to make sure that, at the very least, the application is password protected. Otherwise, any remote user could completely control your server. To protect it, we will add a security domain to cover the application. This can be done in the jboss-web.xml file for the JMX Console, which can be found in deploy/jmx-console.war/WEB-INF/ directory. Uncomment the security-domain in that file, as shown below. This links the security domain to the web application, but it doesn't tell the web application what security policy to enforce, what URLs are we trying to protect, and who is allowed to access them. To configure this, go to the web.xml file in the same directory and uncomment the security-constraint that is already there. This security constraint will require a valid user name and password for a user in the JBossAdmin group. secured access to the HTML JMX console. That's great, but where do the user names and passwords come from? They come from the jmx-console security domain we linked the application to. We have provided the configuration for this in the conf/login-config.xml. This configuration uses a simple file based security policy. The configuration files are found in the conf/props directory of your server configuration. The usernames and passwords are stored in the conf/props/jmx-console-users.properties file and take the form "username=password". To assign a user to the JBossAdmin group add "username=JBossAdmin" to the jmx-console-roles.properties file (additional roles on that username can be added comma separated). The existing file creates an admin user with the password admin. For security, please either remove the user or change the password to a stronger one. The JMX Console isn't the only web based management interface to JBoss. There is also the Web Console. Although it's a Java applet, the corresponding web application can be secured in the same way as the JMX Console. The Web Console is in the file deploy/management/console-mgr.sar/web-console.war.. The only difference is that the Web Console is provided as a simple WAR file instead of using the exploded directory structure that the JMX Console did. The only real difference between the two is that editing the files inside the WAR file is a bit more cumbersome. The Java Authentication and Authorization Service. JBoss uses JAAS to provide pluggable authentication modules. You can use the ones that are provided or write your own if you have more specific requirements. Since the username and password are session variables in the web browser you may need to restart your browser to use the login dialog window.